Legend has it that a certain ill-tempered witch hangs out around Tobermory on the Isle of Mull. While not publicly active as of late, this Dòideag apparently liked to whip up bad weather and make things rough for guys in boats. As the myth goes, She really made things rough for one boat in the Spanish Armada when she blew it up in the town’s harbor. This may or may not have had anything to do with some shady dealings with the MacLeans of Duart…The MacLeans aren’t talking. In any case, I think it’s safe to say that today’s women of Tobermory most likely have nothing against Spanish sailors and may even, on occasion, enjoy a bit of Paella, a nice glass of Tempranillo, and even a bit of sailing providing the water’s not too choppy. The Distillery in Tobermory has been producing whisky since 1797 but its modern single malts have only been produced since 1990. 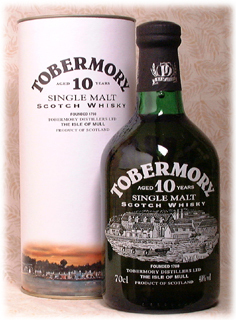 They produce the Tobermory expressions, made from un-peated barley and the peated Ledaig expressions. The Nose: Malty with a faint vegetal note, kind of reminiscent of that Glenrothes tequila thing. There’s a high tone fruit there also, sweetened citrus, lemonade-y. A lighter-bodied nose…kind of a weird phrase, when you think about it, but there it is. The Palate: Although malt notes remain strong, there’s a bit more sweetness here than the nose would lead you to believe. Sweet barley, clean and light. A little lemon creme as well. Perhaps just a hint of smoke, just a little touch of peat smoke as it builds. The Finish: Longer than expected, and with a surprising touch of smoke as well, a very light peat smoke ending. Thoughts: While I wasn’t exactly bowled over by this one, I did enjoy the lightness of it, it was simple and refreshing. It didn’t strike me a the most well-balanced of malts with the vegetal notes of the nose disappearing and the smoke making a surprise appearance at the end, but I thought it was a smooth, clean youngster without harsh rough edges. I have to add that midway through the generous Broken Record pour of this one, an incredible pulled pork sandwich materialized in front of me. I don’t often pair food and whisky together, and certainly did not do so on purpose here, but I gotta say the Tobermory’s stock rose considerably once I dived into the sandwich. The tangy and savory pork brought out much more sherried fruit from the whisky and really made for a really excellent pairing.